I wish I had thought more about the landing gear before I had assembled the pods. Totally forgot about keeping the Main landing gear behind the center of gravity. I thought I had come up with an easy way to install them. But after assembly, she sits like a tail dragger. If anyone has an Idea for retracts, please let me know. Right now I plan to beef up the rear of the nacelles and mount the gear in there. This is a big plane and I love it. Just need to get an air brush. 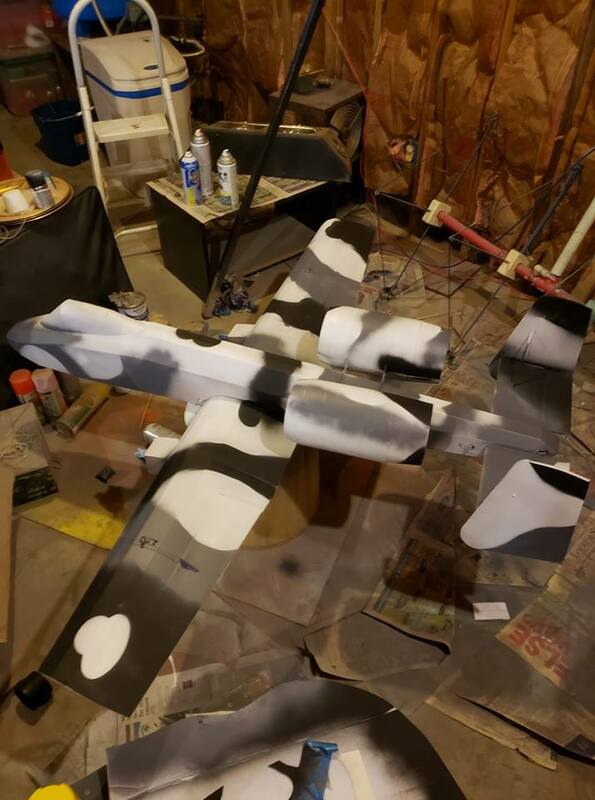 This is my first ever attempt at a camo paint job. Need to touch up the canopy. Finally decided to go with retracts. So wish I had done them before I built the pods and the nose. Still have a few things to clean up, but they work great. Oh, now I do like that!! That is a great idea with retracts, though I don't have enough experience yet to suggest anything or help you achieve that yet. Though I have had the A-10 on my mind for when I have the skill to attempt edf's and you have just give me the beginning of useful idea to place retracts in those nacelles, which will become redundant with edf's. Pretty new to the hobby at the moment and I'm still finding my feet(and wings if I'm honest😂), but I absolutely love the exchange of ideas and ingenuity in this community. Your camo job looks great for a first attempt too. Hope when I do start with paint or decals that mine even look a fraction as good as yours. Just seen your video on retracts there. Was out and about and hadn't data to watch the video or even see a preview image. You just nailed the idea I had brewing in my head😁, only better. I was thinking fold from front to back, but your way will increase strength on landing I suspect. May help put weight further forward too. Great job. Has anybody attempted the A-10 with twin edf's yet do you know? You can't go front to rear, In the down position the gear would be forward of the CG, the plane will just sit in a nose off the ground stance. The pods really need to be about 10mm longer front to rear to accommodate the supplied wheels. they should retract past the 1/2 point of the wheels. In my case they are hitting the top of the motor mount. If mine were not already mounted, I would have built ones to fit the retract. There is a piece of ply the retract is mounted to and that is epoxy glued into the pod. For the nose, the retract is mounted to the side of the front battery compartment. I wish I had done this before I mounted the nose, I could have added some foam stiffeners along the slot for the gear slot I made. I can still add some, but will be a pain with the nose already on the plane. 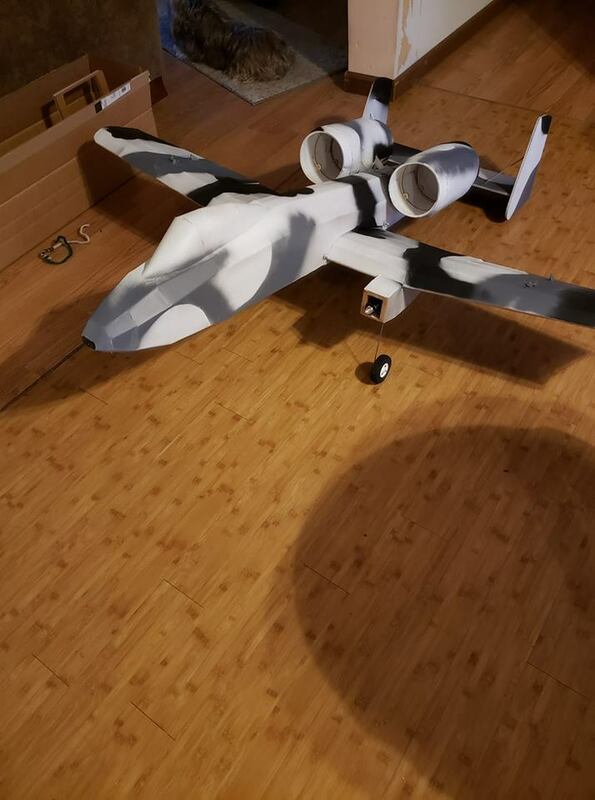 I am also going to run 3 blade 9" props to get just a bit more ground clearance. My original idea netted this result.